Maggie Valley NC is full of wonderful places to see, and is central to many of the most popular attractions in Western NC, including both the Great Smoky Mountains National Park and The Blue Ridge Parkway. As a result, professional and amateur photographers often visit from all around the world, looking for the best places to take photos in Maggie Valley NC. Thankfully, Maggie Valley, and it’s surrounding areas are full of wonderful places to take photos. The Maggie Valley NC area has waterfalls, historic buildings, scenic vistas, wildlife, creeks, old cars, and much more. You could literally live here for a lifetime, and not run out of new and unique places to take photos. Many of the photos taken by famous photographers from this area, are award winners, and decorate many walls of galleries and homes worldwide! 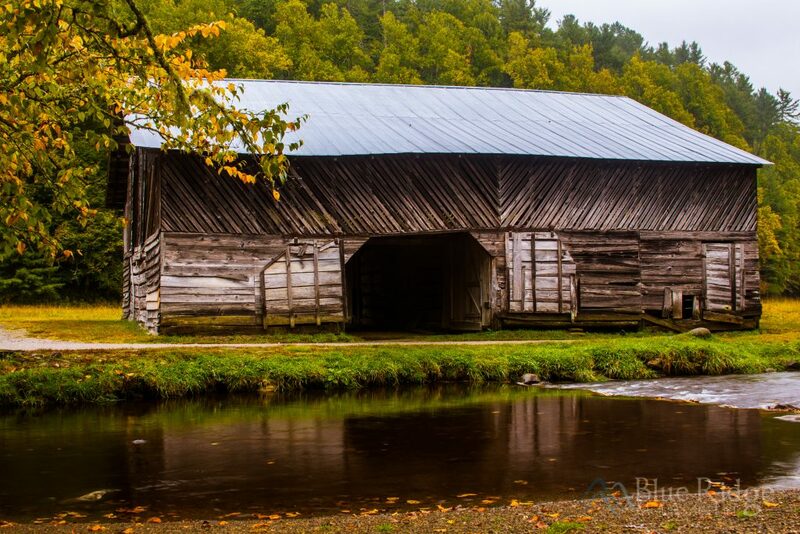 Being photographers ourselves, we’ve been out and around the whole area, and while we’re not going to share all of our secrets, below are some of the best places to take photos in Maggie Valley NC – All within a 1 hour drive from Maggie Valley. Be sure to spend some time in Maggie Valley itself though, as there are many great places for photos, especially along Jonathan Creek and over near the Maggie Valley Country Club. Many probably recognize the fountain photo above, which was taken right in the center of town. Maggie Valley NC is literally right next to the Great Smoky Mountains National Park, and four entrances to the park are accessible within fairly short drives from downtown Maggie Valley: Purchase Knob, Cataloochee Valley, Big Creek, and Heintooga Road. Purchase Knob is the nearest National Park entry point, and is located 20 minutes from downtown Maggie Valley. Purchase Knob is accessible by both car and foot. Accessing it by car requires making a phone call to the Science Center, to be sure you don’t get locked in. If the gate is closed, or the Science Center is closed, you’ll need to hike up the access road. The area around the science center offers exceptional and numerous photo opportunities, and in particular incredible scenic views, like the photo above. There are also creeks, woods, wildlife, and a historic cabin you can photograph as well. Cataloochee Valley is one of those magical places here in Western NC, that you’ll want to visit over and over again. The valley is full of creeks, scenic views, historic homes and barns, hiking trails, and wildlife and in particular Elk. People flock to Cataloochee Valley from all over the world to see the Elk, especially during mating season (called Rut). Cataloochee Valley is about 30-40 minutes from Maggie Valley, along at the end of a long gravel road. While the drive can be a bit nerve wrecking, the photo opportunities completely make up for it. You could literally spend weeks here taking photos, and every time we visit we find something new! Big Creek is probably our favorite place to visit in the whole area. Big Creek is a large creek, that prior to the creation of the Great Smoky Mountains National Park, was surrounded by a very large logging operation. Today, Big Creek is one of the most popular destinations in the Park, and contains a beautiful picnic area, remains of historic structures, hiking trails, Big Creek itself, and two waterfalls, one of which is a very popular swimming hole. Head down to the picnic area, and capture photos of the beautiful bridge and of Big Creek itself. Head up Big Creek Trail to get photos of Big Creek, Midnight Hole, and Mouse Creek Falls. Take many of the side trails along Big Creek Trail for photos ops of Big Creek and the many small waterfalls it contains. While in Big Creek, pay attention – The area is FULL of the remains of the logging operations, including: foundations of old structures, signs of the railway (track, switches, grades, coals dumps), and equipment. Heintooga Road, originates off the Blue Ridge Parkway, but about half way down enters the Great Smoky Mountains National Park. Along the road are a number of scenic overlooks. You’ll also pass the Masonic Marker. At the end of the road is a very nice picnic area that provides nice scenic views, and the entrance to Heintooga Round Bottom Road, a 28 mile long rustic mountain road, that ends in Cherokee NC. This is a fantastic drive, full of photo opportunities, especially if you like wildflowers. Heintooga Road is also a popular place to see Elk in the early morning and late evening. The Blue Ridge Parkway is only minutes from downtown Maggie Valley, and provides numerous beautiful overlooks, tunnels, hiking trails, waterfalls, and places to visit. From Maggie Valley, you can take the parkway West to Cherokee or East to Asheville. The section of the parkway from Maggie Valley to Asheville is considered by most to be the most beautiful section, due to it being the highest elevation section of the overall Blue Ridge Parkway. As a result, there are many breathtaking scenic views. Along the way, you’ll travel though tunnels, pass gorgeous overlooks, and stopping points such as: Highest Point on the Parkway, Devil’s Courthouse, Graveyard Fields, Looking Glass Rock, Pisgah Inn, and Pisgah Mountain. All just full of photo opportunities. If you like waterfalls, be sure to visit Lower and Upper Falls at Graveyard Fields, and Skinny Dip Falls. One of the most photographic locations on the entire Blue Ridge Parkway is only minutes from Maggie Valley, Waterrock Knob. If you’re looking for a nice hike, with great views, the trail up Waterrock Knob is steep, but well worth the climb. Looking or a sunset or sunrise? Waterrock Knob will not disappoint you, unless it’s fogged over. Some of the most beautiful sunsets and sunrises are visible from the Waterrock Knob parking lot, which provides nearly 360 degree views of the surrounding Blue Ridge and Smoky Mountains. Tip – As you enter the parking lot, sunrises will be on your right, and sunsets on your left. Get there an hour early, to get a good spot, especially in the summer, as it can be very busy. >> Read more about Waterrock Knob in our complete guide. Our personal favorite area of the Parkway, especially in the Fall is Graveyard Fields – So named for fallen trees overgrown with moss that looked like Gravestones in the early 1900s. Graveyard Fields, located at Milepost 418.5, has hiking trails, gorgeous fall scenery, three waterfalls, and blueberries everywhere in the July/August. Due to the unique vegetation, yellowstone prong that flows down the middle, and the three waterfalls, Graveyard Fields provides nearly unlimited photo opportunities. >> Read our Guide to Graveyard Fields for more information. A real hidden Gem of Maggie Valley, is Soco Falls, located just to the west of the Blue Ridge Parkway. Many visitors to the Maggie Valley area, literally drive right by it, when heading to Cherokee and don’t even know it. What a shame, because Soco Falls, as you can see in the photo, is a gorgeous duel waterfall. Soco Falls is literally located almost right next to Highway 19. From the Observation deck, you can capture gorgeous photos of the Fall. One common technique is to capture nearly identical photos from here, during the different seasons. For those that want a more unique compositions of Soco Falls, head to the left from the Observation deck, and use the climbing ropes to head down to the bottom of the Falls. Be careful, it’s slick, and you’ll have to climb back up, but if you can make it, the climb is so worth it. The photo above is taken from below the falls, and there are numerous photo ops on down the creek below Soco Falls as well. The best lighting is in the morning or late afternoon. You an also visit on a cloudy/rainy day, for good lighting and vibrant colors, especially in the Fall. >> See our full guide to Soco Falls for directions, information and more photos. Located around the corner from Maggie Valley, NC in a small incorporated area named Jonathan Creek (called J Creek by locals) and the historic Hemphill Road. Hemphill Road is full of Christmas Tree Farms, old barns and homes, scenic views of Purchase and Utah Mountain, and the home place of the famous moonshiner, Popcorn Sutton. Hemphill Rd is also the road up to The Swag and Purchase Knob. Hemphill Road is located 10 minutes from downtown Maggie Valley, 2.5 miles down Highway 276 towards I-40. The drive up Hemphill is a great to drive along, even if you’re not a photographer. As you drive up to the top, and reach the gate for Purchase Knob, you’ll find numerous photo opportunities along the way. Tip – Many areas up Hemphill Road are private property that you’ll want to respect. Always stay on the roadsides when taking photos, and try to pull off the road and out of the way when stopping. Also be sure to visit early in the morning or late in the evening for the best light. During the morning, Hemphill Road is often foggy or fogged over, making for interesting and beautiful compositions. If you don’t mind a little longer drive, Max Patch, located off I-40 going to wards Tennessee provides some of the best views available. Max Patch is a scenic bald that provides 360 degree views of the surrounding Blue Ridge and Smoky Mountains. Anytime is a great time to take photos, but sunrise and sunset are exceptional. While visiting Max Patch, you’ll also get to walk along the famous Appalachian Trail, and often see AT Hikers. For more information, including directions and more photos, see our Max Patch Guide. Cataloochee Ranch is located at the top of Fie Top road, and the historic ranch has horseback riding, an Inn, Cabins, and Hiking Trails. The Ranch is very high up, and offers some fantastic views, along with gorgeous grounds and scenery. We would recommend going up in the afternoon, parking at the Inn, and just walk around. You’ll find many different photo opportunities, including the frog pond, stables, the Inn itself, and the surround grounds. Drive down past the horse barn for some incredible scenic views and photos of the horses. As evening approaches, head back to the Inn for wonderful dinner and entertainment after. Be sure to make reservations if you aren’t staying at the Inn, as guests get first priority. Lake Junaluska is a private lake located 13 minutes from Maggie Valley. The Lake is surrounded by 3.5 mile paved walking trail, that provides gorgeous views of the lake and surrounding structures. There are numerous photo opportunities all around the lake, including the lake itself, the Dam that forms the lake, the many buildings and churches, and inspiration point which includes a large white cross, that is lite up at night. To reach Lake Junaluska, take Highway 19 (Soco Road) from Maggie Valley towards Waynesville 9.1 Miles. You’ll see the Lake on the left. There is numerous public parking areas available all around the lake. Get out early, morning light often provides the best lighting for photos. If you aren’t a morning person, late afternoon is also a good time, although morning light is the best. Use a Polarizing Filter – they cut glare, and enhance the colors a little to more closely capture what your eye sees. Avoid stopping in roads and blocking traffic, even on back roads. Find a safe place to pull over, out of the way instead. If you plan to shoot waterfalls, bring a tripod and use longer exposures to capture the movement of the water. Follow these 6 tips to make the most our of your photos when visiting. Share your photos in our Maggie Valley NC Life Facebook group!